Excel 2013 displays a Paste Options button with the label, (Ctrl), to its immediate right at the end of the pasted range, after you click the Paste button on the Home tab of the Ribbon or press Ctrl+V to paste cell entries that you copy to the Clipboard. When you click this drop-down button or press the Ctrl key, a palette appears with three groups of buttons. Paste (P): Excel pastes all the stuff in the cell selection (formulas, formatting, you name it). Formulas (F): Excel pastes all the text, numbers, and formulas in the current cell selection without their formatting. Formulas & Number Formatting (O): Excel pastes the number formats assigned to the copied values along with their formulas. Keep Source Formatting (K): Excel copies the formatting from the original cells and pastes this into the destination cells (along with the copied entries). No Borders (B): Excel pastes all the stuff in the cell selection without copying any borders applied to its cell range. Keep Source Column Widths (W): Excel makes the width of the columns in the destination range the same as those in the source range when it copies their cell entries. Transpose (T): Excel changes the orientation of the pasted entries. For example, if the original cells’ entries run down the rows of a single column of the worksheet, the transposed pasted entries will run across the columns of a single row. Values (V): Excel pastes only the calculated results of any formulas in the source cell range. Values & Number Formatting (A): Excel pastes the calculated results of any formulas along with all the formatting assigned to the labels, values, and formulas in the source cell range into the destination range. This means that all the labels and values in the destination range appear formatted just like the source range, even though all the original formulas are lost and only the calculated values are retained. Values & Source Formatting (E): Excel pastes the calculated results of any formulas along with all formatting assigned to the source cell range. Formatting (R): Excel pastes only the formatting (and not the entries) copied from the source cell range to the destination range. Paste Link (N): Excel creates linking formulas in the destination range so that any changes that you make to the entries in cells in the source range are immediately brought forward and reflected in the corresponding cells of the destination range. 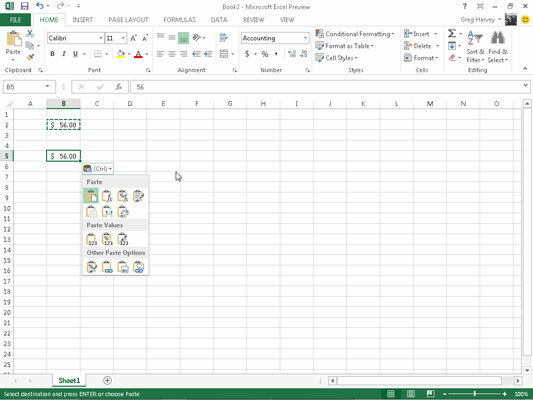 Picture (U): Excel pastes only the pictures in the copied cell selection. Linked Picture (I): Excel pastes a link to the pictures in the copied cell selection. All to paste all the stuff in the cell selection (formulas, formatting, you name it). Comments to paste only the notes that you attach to their cells. Validation to paste only the data validation rules into the cell range that you set up with the Data Validation command (which enables you to set what value or range of values is allowed in a particular cell or cell range). All Using Source Theme to paste all the information plus the cell styles applied to the cells. All Except Borders to paste all the stuff in the cell selection without copying any borders you use there. Column Widths to apply the column widths of the cells copied to the Clipboard to the columns where the cells are pasted. All Merging Conditional Formats to paste Conditional Formatting into the cell range. None to prevent Excel from performing any mathematical operation between the data entries you cut or copy to the Clipboard and the data entries in the cell range where you paste. Add to add the data you cut or copy to the Clipboard and the data entries in the cell range where you paste. Subtract to subtract the data you cut or copy to the Clipboard from the data entries in the cell range where you paste. Multiply to multiply the data you cut or copy to the Clipboard by the data entries in the cell range where you paste. Divide to divide the data you cut or copy to the Clipboard by the data entries in the cell range where you paste. Skip Blanks check box when you want Excel to paste everywhere except for any empty cells in the incoming range. In other words, a blank cell cannot overwrite your current cell entries. Transpose check box when you want Excel to change the orientation of the pasted entries. For example, if the original cells’ entries run down the rows of a single column of the worksheet, the transposed pasted entries will run across the columns of a single row. Paste Link button when you’re copying cell entries and you want to establish a link between copies you’re pasting and the original entries. That way, changes to the original cells automatically update in the pasted copies. The options that appear on the Paste Options palette are context sensitive. This means that the particular paste options available on the palette depend directly upon the type of cell entries previously copied to the Office Clipboard. Additionally, you can access this same palette of paste options by clicking the drop-down button that appears directly beneath the Paste button on the Ribbon instead of clicking the Paste Options button that appears at the end of the pasted range in the worksheet or pressing the Ctrl key on your keyboard.